The story of Chris Simpson is one of grit and determination, of escaping an unhealthy lifestyle and changing things for the better. But most of all, it’s the story of a man who’s love for life – and bike riding – is an inspiration to everyone around him. At the end of 2011 it had been a good fifteen years since Chris Simpson stopped playing footy. Since then a lot of cigarettes had been smoked and a fair bit of weight had accumulated on his body. As Chris jumped on the scales, the arrow stopped at 134 kg. It was definitely time for a lifestyle change. Chris and his wife were new parents to their son Ben and decided to lose some “baby weight” together. The cigarettes were quickly dropped and a lifestyle of healthy eating and regular exercise was introduced. Chris started running and was aiming to be able to run ten kilometres in under an hour. He broke is goal into smaller milestones of running for five, ten and fifteen minutes without stopping. As his weight dropped to 105 kg Chris was able to run five kilometres in under half an hour and was on his way to achieve his ten kilometre goal. Chris registered for a ten kilometre fun run and, to his own surprise, ran it in under 42 minutes. 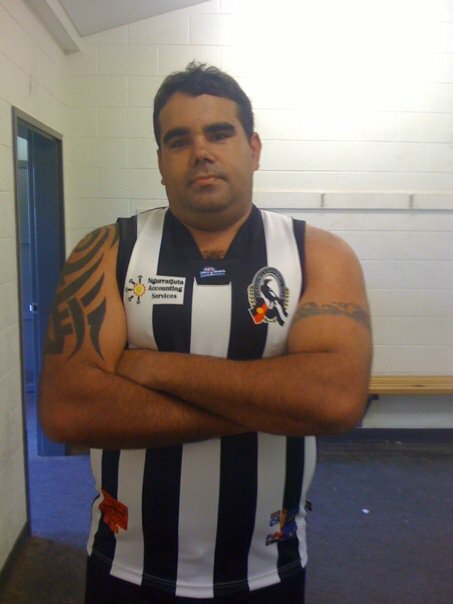 At 134 kg Chris was not likely to be drafted to play for Collingwood anytime soon. About six months into his new exercise regime Chris found a 1991 Cannondale SC 600 on Ebay and decided on a new goal: Riding to work every day. 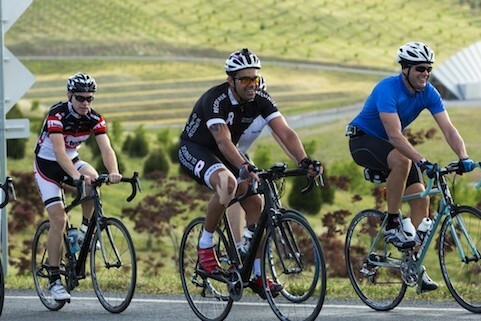 This was a 27 kilometre commute along the beautiful rolling hills of Canberra and surrounds. Chris’ maiden ride was on a cool winter morning and the thermometer was showing minus three degrees. As a bit of a rookie, Chris only had a pair of fingerless gloves to wear and had to turn around shortly into his commute because his fingers weren’t coping with the extreme wind chill. “After defrosting my fingers with the hairdryer I went down to the bike shop and got a decent pair of winter gloves and I’ve been riding to and from work ever since”. Being a competitive guy, Chris quickly turned his newfound hobby into a game. “When I rode to work I would time myself and then try to beat my time the next day. I love finding new ways of challenging myself on the bike”. Chris’ competitive streak and outgoing personality was noticed by RECOGNISE, a social cause working to recognise Aboriginal and Torres Strait Islanders in the Australian Constitution. In 2013 RECOGNISE signed Chris up to ride from Alice Springs to Katherine, with a group of nine other cyclists, covering 1,200 kilometres. In the scorching Northern Territory sun, the group rode in temperatures of around 33 degrees over ten days. 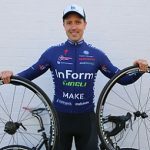 “I was really in the hurt locker throughout the ten days, but one of the guys, who was a former pro rider, kept me motivated by talking about the cold Peronis waiting for me by the pool side at the hotel”, says Chris. “Of course, there turned out to be no pool and the cold Peronis were really cans of warm XXXX beers, but it got me through it”. Chris’ love for cycling grew further when he did the Amy Gillett Foundation’s seven-day Share the Road Tour around Tasmania later that year. “Not knowing too much about cycling, I learned a lot about how to ride a bike from people like Steven Hodge, Brad McGee, Wes Sulzberger and Rachel Neylan. It was amazing to ride and learn from people who are the best, even though I had no idea who they were at the time”. With his charismatic and forthcoming personality, Chris is talented in getting people together to go for a ride. “I’m unpopular with the wives of a few of the guys I ride with. They’ve all had to upgrade their bikes because of all the riding I’m getting them on to”. These days Chris doesn’t want to miss any opportunity to jump on the bike, even when he probably shouldn’t. Three weeks after returning from the Share the Road Tour, Chris was still on a high from his experiences in Tasmania. One morning he felt a lump poking out of his groin and rushed to the doctor’s to have it checked. An ultrasound showed a double hernia. Chris’ first response to the doctor was “can I still ride my bike”? In the weeks leading up to his operation, Chris couldn’t stay off his bike and often had to push in the hernia when riding up hill. Shortly before his operation, Chris was served another blow. One morning he was on his way to work and was only a hundred meters or so from his workplace when he was struck by a car crossing the bike lane. Chris was hurled to the ground. He heard a big crack as his bike went straight under the front wheel of the car. As he came to his senses he realised his bike had been torn in half by the weight of the car. The driver came storming out as Chris threw his glasses on the ground in despair. The driver was clearly worried about Chris’ condition but Chris was more worried about the condition of his bike. The driver happened to work in the same building as Chris and messaged him throughout the day to check up on him. The driver wanted to make good the damage and offered to pay for Chris’ wheels, “how much are they, about $100?”, she said. “No”, was the short answer. “Did you ride Kmart or the Rolls Royce?”, was the next question. “Rolls Royce”, said Chris. Luckily, the driver was insured and the bike and $2,500 wheels were covered in the end. In mid 2014 Chris had recovered from the accident and his hernia operation and he was back to doing his usual morning rides with mates. One morning, one of Chris’ riding buddies introduced him to Everesting and Chris was immediately attracted to the idea. The concept of Everesting is simple: find a hill and ride it enough times to ascend 8,848 vertical meters (the elevation of Mount Everest) in one consecutive ride. 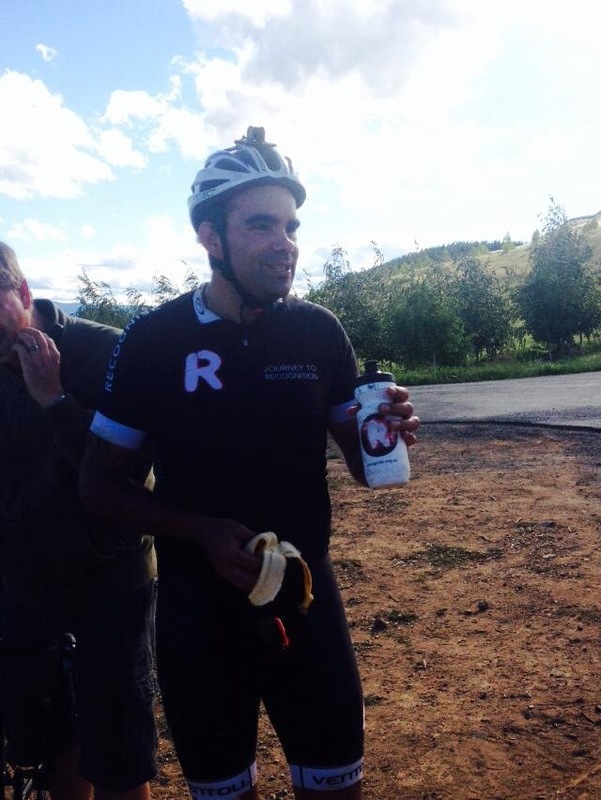 The idea of Everesting grew on Chris: “I’m no climber, but having a crack and earning the Everesting jersey really appealed to me. One Friday night, after some cheese and a few too many bubbles, Chris declared that he was going to Everest the National Arboretum in Canberra. The following day, Chris and a couple of riding buddies took some measurements of the hill and figured out it would require 109 laps over 302 kilometres to achieve the 8,848 ascent. Chris quickly realised that his Everesting attempt had the potential to create a bit of hype within the local community and decided to involve RECOGNISE in the event. “The guy from RECOGNISE called it a crazy idea, but a good idea, which they were happy to be involved in”, says Chris. Once RECOGNISE got involved, the event really started to take shape. The local member of the ACT Legislative Assembly, Shane Rattenbury, got involved and secured Chris the rights to use the road for the event. Chris’ crazy climbing attempt also reached the Chief Minister of the ACT, Katy Gallagher, who helped spread the word through social media. At the same time, the news spread through the cycling community: “I did a photo shoot with RECOGNISE and we created a flyer which went all over the internet. Local cycling clubs shared the flyer through their websites and forums, and a lot of people tweeted about it too. The large turnout on a day with such bad weather showed just how strong the cycling community is. I was so humbled and grateful that people showed their support”. Chris’ big day was 1st of November 2014. His alarm clock went off at 1.50 AM but Chris was already awake. In fact, he hadn’t really slept the last couple of nights leading up to his Everesting attempt. Chris could feel the butterflies churning in his stomach. It had been five months since he proclaimed his plans to Everest the Arboretum and he had spent countless hours training to go from being a non-climber into someone who has a realistic chance of climbing 8,848 meters in one ride. Now it was crunch time. At 3 a.m. Chris and a small support crew of friends and family were going through the last preparations on site. A stranger called Damo – the first of many – showed up to ride with Chris from the get go. At 3.15 Chris and his new friend Damo started the first lap. At 4.30 a.m. the wind started showing its force. Winds of 65 kilometres per hour were gusting from all directions. The uphill climbs were suddenly a lot tougher and the descents turned into a dangerous game of human pinball. Despite the tough weather conditions, more and more riders turned up to support Chris throughout the day. “I never rode alone. After about 7 a.m. I had a minimum of ten riders with me at all times. Some people just stayed for a lap or two – Stephen Hodge rode with me for five hours”. Over 200 riders turned up to ride with Chris throughout the day. As the wind continued to blow like mad, Chris started to doubt himself. One support rider had already been blown off his bike and the wind was showing no sign of relief. “What am I doing? Why do I think this is smart?”, Chris thought to himself as the negative thoughts started to creep in. He had prepared well for the event but not for extreme winds. He thought he would be rolling over the finish line between 8 p.m. and 9 p.m., but at 6.30 p.m. Chris still had a long way to go. “Before the attempt I sent my heart rate and power files from my training rides to National Centre for Indigenous Excellence. They then gave me a nutrition program which stated how much to eat and drink during the ride, under normal conditions. But because of the windy conditions I needed an extra thirty percent, so I was really falling behind on my eating”, says Chris. “24 laps to go and about an hour before my meltdown”, says Chris. “Riding next to me was a lady, Flipper, who had done Everesting four times. I said to her “I don’t think I can go on, this is really, really hard”. She said “That’s the first time you’ve spoken negatively all day, I think you’re hungry”. She rode ahead and organised a change of clothes and some food for me which got me going again”. From then on Chris stopped for a meal every three laps and his confidence started to come back as the number of remaining laps reduced one by one. At 10 p.m. Chris had nine laps to go and everything was going well. The group of eight remaining riders were incredibly tired but in good spirits as they saw the finish line getting closer. Three laps to go: “My mind was gone but my legs pushed me through the night”. With less than three laps to go Chris’ Garmin decided to give up, stopping at 8,555 metres. Chris spent a while trying to get the damn thing working again but decided to continue without GPS. 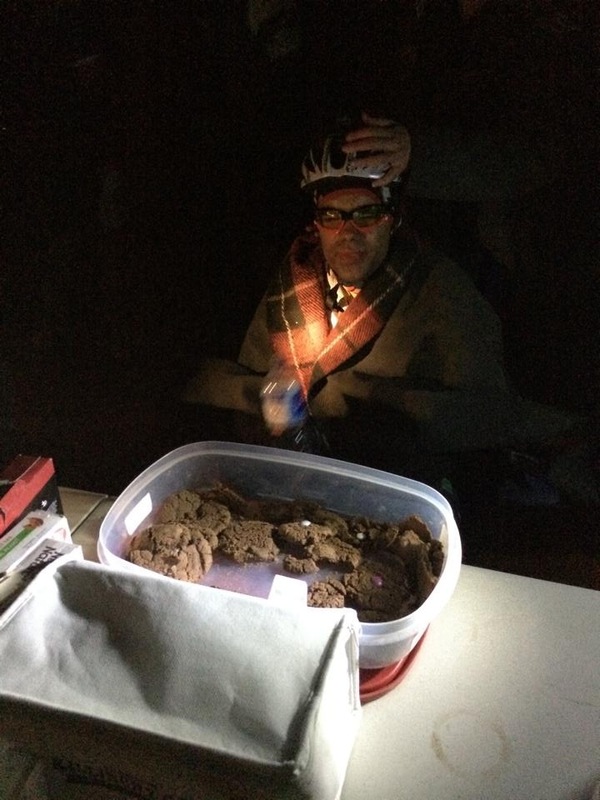 Just past 1 a.m., after more than 22 hours in the saddle, Chris crossed the finish line. His adrenalin was pumping through his veins and he had an acute sense of pride. Just a few years earlier he was an unhealthy and overweight chain smoker and now he had climbed the world’s tallest mountain. Awesome. There is no doubt cycling has changed the Simpson family’s life for the better. In fact, bike riding is now an integral part of the whole family’s daily routine. “Pretty much my whole family rides these days. I sometimes go for rides with my partner and this year I have also been lucky enough to go for a ride with my mum. She is 65 years of age and rides five days a week”, says Chris. Chris is certain his love of everything bicycle will continue for many years to come: “I love being healthy and exercising these days. I think my lifestyle change has probably added another 25 years to my life. Now I really look forward to riding well into my seventies”. 1. Favourite cyclist and why? That’s a tough one. I would have to say Alberto Contador – El Pistolero – winner of the three grand tours. I love his awesome climbing style, dancing on the pedals, the pistol shot and how he attacks (much the opposite of me!). Do: smile, ride, ride often, be safe and remember the bike brings so much freedom. Don’t: be a snob. Being on the bike is better than being on the couch. 3. Best training Tip: get those VMOs as close to the top tube as possible. When climbing look for relief points and open up your lungs, take big deep breaths and just tap, tap, tap (thanks Hodgey). 4. Best cycling trip: my first cycling trip riding from Alice Springs to Katherine (to be honest at that stage I had never ridden over 80 kilometres). The support crew and riders were a great bunch of guys and girls. Great feeds, great scenery, awesome times. 5. The best bike you’ve ever ridden: I have owned a few weapons of mass destruction including a 1991 Cannondale SC600, Malvern Star Oppy, 2008 Trek Madone 5.2, 2011 TCR SL0, Focus Cayo Evo and my current whip, a 2014 Trek Domane 5.9. The Domane is such a nice ride. I was hesitant coming from my two previous Di2 bikes but the DA9000 shifts effortlessly and the ride of the Domane is so comfy… and looks awesome. A great read! Thanks for sharing it Chris.